400 winners around the globe. ​ IRISH émigrés helped build America, most came from humble backgrounds rising to positions of wealth and power by sheer dint of hard work. El Prado is an equine example of an Irish-bred who won respect in the Bluegrass, although his pedigree is far from plebeian. He crossed from the Old World to the New to find fame and fortune, but wasn’t exactly welcomed by breeders when he first set foot in Kentucky, despite both his parents being Americans. Raced by the late Robert Sangster and trained by Vincent O’Brien, El Prado was Ireland’s Champion Juvenile in 1991, winning four of six starts including the National Stakes-Gr.1, Railway Stakes and Beresford Stakes but the big grey was unplaced in three starts at three. From a European point ofview he possessed a splendid pedigree, being a son of Sadler’s Wells (USA), 14-times Champion Sire of UK and Ireland. His dam, Lady Capulet (USA), won the 1977 Irish 1000 Guineas-Gr.1 and is a daughter of 1968 English Derby and 2000 Guineas winner Sir Ivor (USA). She also produced the Gr.3 winner and Gr.1 placed sire Entitled (Mill Reef) and her dam, Gr.3 runner-up Cap and Bells (Tom Fool), also produced Gr.2 winner and sire Sir Wimborne (Sir Ivor) and is a sister to American Derby-Gr.1 winner and sire Dunce, both from the Mahmoud mare Ghazni. The man responsible for selecting El Prado to stand in the US was Dermot Carty. He purchased the horse for Austrian-born billionaire Frank Stronach as his initial foray into the stallion business. A successful thoroughbred owner in Canada and the US, Stronach’s horses have won the Queen’s Plate, Belmont Stakes, Preakness Stakes and Breeders’ Cup Classic and he had early success with champion Glorious Song (racing her with Nelson Bunker Hunt). He has won several Eclipse Awards as Outstanding Breeder in the US, and Sovereign Awards for the same feat in Canada. Purchasing El Prado privately from Coolmore in the early 1990s, Stronach initially stood his young sire at Airdrie Stud in Kentucky, owned by Brereton C. Jones. When Stronach started his Adena Springs operation near Paris, Kentucky, El Prado was transferred and remained there until his death from an apparent heart attack, aged 20, on September 21, 2009. 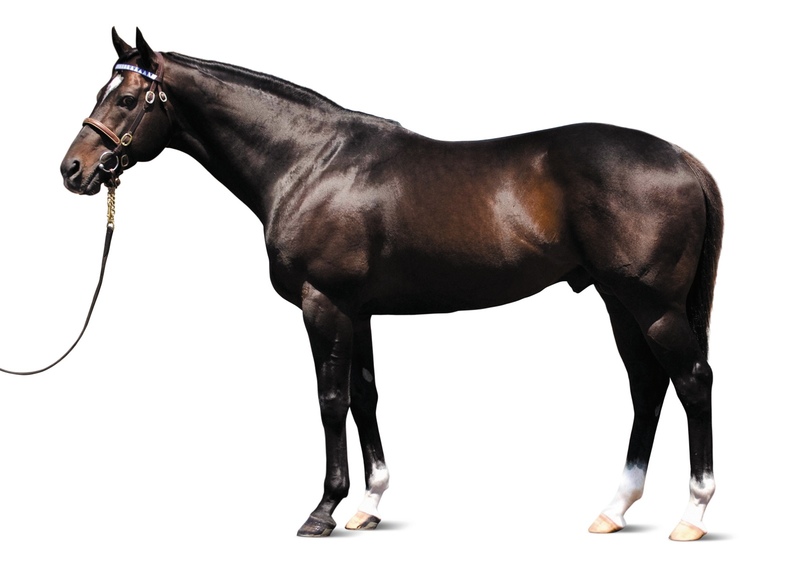 El Prado became Champion Sire in the US in 2002 and his best runners include Champion Turf Horse Kitten’s Joy, now a leading sire in the US; successful shuttler and Breeders’ Cup Mile-Gr.1 winner Artie Schiller (USA); and triple Gr.1 winner and successful international sire Medaglia d’Oro (USA) (ex Cappuchino Bay by Bailjumper), who is the subject of this stallion profile. Medaglia d’Oro began his stud career in the US in 2005 and Australia in 2010. In the north his runners are led by his first crop Champion Three Year-Old Filly and Horse of the Year Rachel Alexandra (Roar), whose 13 wins included a victory over the males in the Preakness Stakes-Gr.1 as well as success in the Kentucky Oaks-Gr.1 and Mother Goose Stakes-Gr.1. His other Gr.1 winners there include Marketing Mix (Kris S), Plum Pretty (A.P. Indy), Gabby’s Golden Gal (Ashkalani), Champagne d’Oro (Saratoga Six), C.S. Silk (Settlement Day), Violence (Gone West), Passion For Gold (Thunder Gulch), Warrior’s Reward (Seeking the Gold), Lochte (Lemon Drop Kid) and this year’s Gulfstream Park Turf Handicap-Gr.1 winner Mshawish (Thunder Gulch), one of nine stakes winners in 2015 (to mid-March). on March 21 taking the colt’s earnings to $2.36m. This Gai Waterhouse-trained juvenile won the Listed Breeders’ Plate on debut and then collected the Canonbury Stakes-Gr.3 and Todman Stakes-Gr.2 (1200m in 1:08.83) on March 7 to ensure favouritism for the Golden Slipper, a race he won by three-quarters of a length in 1:09.74, from stable mate English (Encosta de Lago). He is also the sire of gelded Manfred Stakes-Gr.3 winner Java (ex Dawn Attack by Fantastic Light), fourth to Dissident in the C.F. Orr-Gr.1 on February 14 and of the talented Nostradamus (ex Leone Chiara by Lion Hunter), winner of the 2014 San Domenico Stakes-Gr.3 and runner-up to Brazen Beau in the Roman Consul-Gr.2. His stakes placed runners include Shaumari (Canny Lad), Matilija (Red Ransom) and Thalia (Elusive Quality), while he is also sire of promising Meursault (Sequalo). His complete international stats (to mid-March) are 416 winners from 684 starters (60.8%) of more than $60m (300 winners from 488 runners of $30m in the US) and his 66 stakes winners represent a high 9.6% of starters. He has had 19 winners from just 25 runners in Japan for earnings topping $5m and has had winners in Canada (25 from 47 starters), the UK, France, UAE and Hong Kong, to name just a few countries where his runners have also enjoyed success. It is no surprise Medaglia d’Oro, who started his career on a fee of $US35,000 and was purchased by Sheikh Mohammed for a reported $60m following the success of his first runners, has become a successful sire for Darley as he was a first rate performer on the track in the US where he won eight of 17 starts and more than $US5.7m, winning three times at Gr.1 level and finishing second (twice) in the Breeders’ Cup Classic-Gr.1. Seven of his eight wins came in Gr.1 or Gr.2 events from 1700m-2000m and the other was his 4.25 length maiden win over 1200m at Oaklawn. He won the Jim Dandy-Gr.2 (1800m) by 13.75 lengths. His seven seconds included six at Gr.1 level (1800m-2400m) and as well as his runner-up placings in the Classic, he was also second in the Dubai World Cup, Belmont Stakes (half-length), Pacific Classic and Wood Memorial (a head to Buddha) and he was fourth in the Kentucky Derby-Gr.1 (2000m). He was bred by Albert and Joyce Bell and won his first start as a three year-old after a second at his only start at two for trainer David Vance. He was then sold to Edmund A. Gann and sent to trainer Robert Frankel, retiring at five after a second to Pleasantly Perfect in the World Cup. The horse covered 97 mares in his first southern season (2010) at $88,000 and this resulted in 67 live foals. He then covered books of 108 (74) and 86 (68) at $77,000 and then 118 (80) and 148 in 2013 and 2014 at $55,000. Last year his book included Al Anood (dam of 2015 Blue Diamond winner Pride of Dubai), dual Gr.1 winner Fashions Afield, Grand Prospect (dam of Gr.1 winner Grand Journey), Gr.1 winner Hurtle Myrtle, Just Discreet, Lady Lynette, Madam Pedrille, Pantenny, Romneya, Skates (dam of Vancouver, Juste Momente and Captain Coltish), Valourina and Vocabulary. a long-standing record held by Highflyer and ended by Danehill in 2005, the year Sadler’s Wells was named Champion Sire of Broodmares. It is remarkable that of all the sons of Northern Dancer who went to stud many of them with better race records, Sadler’s Wells would reign supreme. Perhaps it was the fact that he proved tough and durable on the track, winning both his starts at two including the Beresford Stakes-Gr.2 for his breeder Robert Sangster and partners and trainer Vincent O’Brien and then four of his nine starts at three (and three seconds) including the Irish 2000 Guineas-Gr.1, the Eclipse Stakes-Gr.1, showcasing his speed and courage to beat Time Charter, and the Phoenix Champion Stakes-Gr.1. He was also runner-up to Darshaan in the French Derby and to Teenoso in the King George VI and Queen Elizabeth Stakes. Sadler’s Wells wasn’t one of the high priced Northern Dancer sons raced by Sangster either, but rather a homebred. His small but very fast dam Fairy Bridge (she won twice over 5f at two, her only starts for Sangster) is a half-sister to the sale-topping Nureyev (Northern Dancer-Special by Forli), with Sangster being outbid on the $1.3m colt at Keeneland in 1978 by shipping magnate Stavros Niarchos, the year after Northern Dancer had won the second of his Champion UK Sire titles. Fairy Bridge (Bold Reason) is also the dam of Fairy King (USA), the once-raced brother to Sadler’s Wells who also carved out an international stud career especially as the sire of recently-pensioned Encosta de Lago in Australia, and a three-quarter brother to Perugino (Danzig), who won his only start (at 6f at two) and also became a useful sire, his main runner being the six-times Gr.1 winner and leading Australian sire Testa Rossa. In his book Thoroughbred Stallions, Tony Morris described Sadler’s Wells as “all horse, toughness, honesty and class, and if he was not going to make a sire, we all might as well take up basket-weaving”. That assessment proved correct, for Sadler’s Wells’ first crop included Dewhurst-Gr.1 dead-heaters Prince of Dance and Scenic (IRE) (who initially spread the word Down Under), Coronation Cup winner In The Wings and French and Irish Derby winner Old Vic, while the second crop included English 1000 Guineas and Oaks winner Salsabil. They were the first in a stream of Gr.1 winners, leading pedigree information provider ARION crediting the sire with 1763 starters, 1209 winners (69% of starters), 294 stakes winners (16.7%) including 73 Gr.1 winners for earnings of over $218 million including high profile sire sons like Montjeu (IRE), High Chaparral (IRE) and Galileo (IRE), the latter the current Champion Sire of Europe and a brief shuttler here (2002-06). Medaglia d’Oro’s dam, Cappucino Bay, won five races to Listed level in the US to 1300m and is a daughter of the Damascus horse Bailjumper, winner of five of his 13 starts including the Saranac Stakes-Gr.2 and Dwyer Stakes-Gr.2. Bailjumper’s son Skip Trial left 1998 US Horse of the Year Skip Away (18 wins and $US9.6m), a Champion Three Year-Old and twice Champion Older Horse whose wins included the Breeders’ Cup Classic. Damascus (Sword Dancer) was also a Horse of the Year and his 21 wins in 32 starts included the Belmont and the Preakness (he was third in the Kentucky Derby) at three when he also won the Jockey Club Gold Cup and American Derby. A champion handicapper and noted for his tough runners, he had a long and successful career at Claiborne Farm in Kentucky where he died in 1995, aged 31. Cappucino Bay has five winners including Gr.3 winner Naples Bay (Giant’s Causeway) and stakes placed Express Bay (Metfield) and her dam Dubbed In won six races and is by the Champion US Two Year-Old Colt of 1969 Silent Screen (Prince John) and from the unraced Society Singer by another top class juvenile in Restless Wind (by Blenheim grandson Windy City) from Social Position by Ribot from Royal Society by Royal Charger. This is family 9b and Medaglia d’Oro’s second dam Dubbed In is inbred to this family, her pedigree featuring the mare Sunday Evening (Medaglia’s d’Oro’s sixth dam) 3fx4f as Sunday Evening is also the second dam of Silent Screen. This is also the family of early shuttler (from 1988), Gr.1 winner and sire Bluebird (Storm Bird-Ivory Dawn by Sir Ivor), whose descendants could be a good fit with Medaglia d’Oro. Remember that Buy dumps excellent way of investing. He’s already met with success with Danehill-line mares and should suit mares carrying the Sir Ivor son Sir Tristram, particularly via Zabeel whose dam is by Nureyev, a three-quarter brother to Sadler’s Wells.